Prep your wittiest one-liners and arm your Sheep-Guns! This spring, WizKids Games heads over to the wilder side with the latest Marvel HeroClix release, Deadpool! 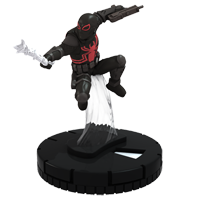 The “Merc with a Mouth” takes center-stage in this latest Marvel HeroClix set, with sub-themes focusing on the Deadpool Corps and the Deadpool’s rogues gallery! 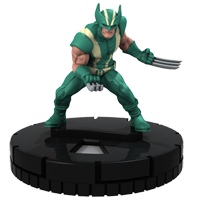 If that weren’t enough to delight Marvel HeroClix fans, other sub-themes in the set include the all-new Thunderbolts, the Heroes for Hire, and MORE! 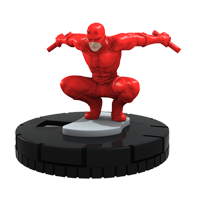 Next up, we switch the spotlight over to the Marvel HeroClix: Deadpool 24 Ct. Gravity Feed display! As with previous displays attached to a large release, the Deadpool Gravity Feed includes 24 foil packs and 10 different characters, each with a new dial-design found only in this product. 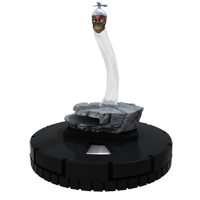 The Marvel HeroClix: Deadpool Gravity Feed display will release before the main set, and offers stores and players a taste of the exciting action to come with the main set release. 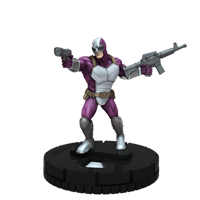 Not to be content as just a sub-theme to main five-figure booster release, the all-new Thunderbolts are back in their own six-figure HeroClix Fast Forces Pack! 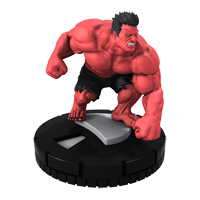 In this latest 6-figure HeroClix Fast Forces offering, General Thaddeus “Thunderbolt” Ross has assembled a whole new strikeforce bearing his name! As the Red Hulk, Ross leads Deadpool, the all-new Venom, Punisher, Elektra, and the mysterious Mercy into battle! As with prior Organized Play kits, this OP kit is marked “Not For Resale” and is available while supplies last. 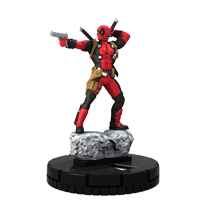 Lastly, as a special treat, here’s a bonus preview from Marvel HeroClix: Deadpool, the man himself: Deadpool! Leave your foes counting sheep with the Sheep Gun!and look for more exciting previews to begin soon! 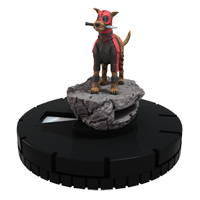 Be sure to pre-order your Marvel HeroClix: Deadpool at your friendly local game and comic stores today! 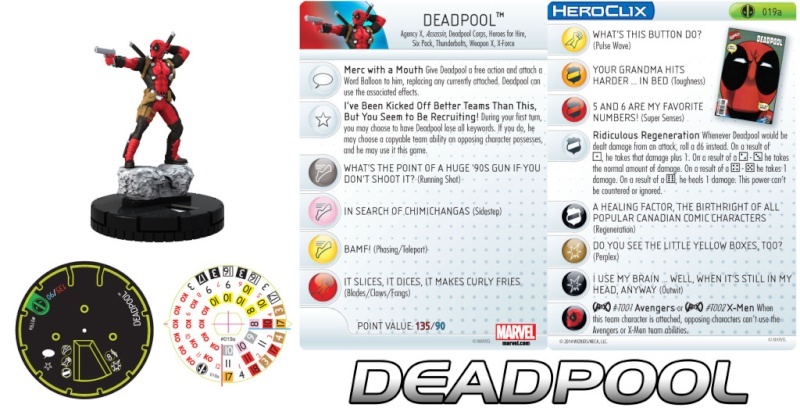 Marvel HeroClix: Deadpool will be available in stores everywhere May 2014! Ahem. 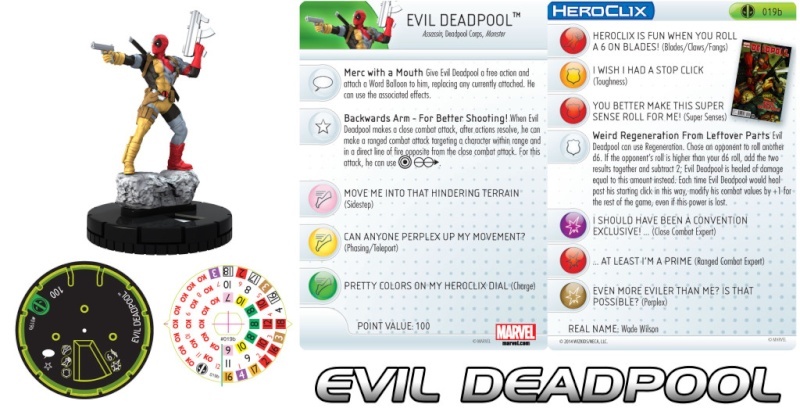 Evil Deadpool hits the battlefield at 100 points and his tampo he has the Word Balloon symbol, which is explained on his character card as follows: Merc with a Mouth: Give Evil Deadpool a free action and attach a Word Balloon to him, replacing any currently attached. He can use the associated affects. Evil Deadpool has a colorful dial that starts and ends with a click of Sidestep [Seriously, move me into that hindering terrain] and the previously mentioned Close Combat Expert. Defensively, Evil Deadpool starts with a pair of clicks of Toughness to help reduce damage dealt to him. For theme team building purposes, Evil Deadpool has the Assassin, Deadpool Corps and Monster keywords. Evil Deadpool leaves plenty of room for other attackers and support characters – but remember that only one Prime figure can be included on your force. 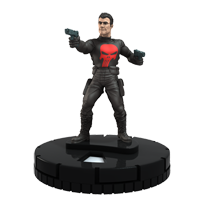 In today’s Marvel HeroClix: Deadpool preview, we bring you a sinister villain who once masqueraded as an Avenger! During Norman Osborn’s Dark Reign, this assassin and enforcer came into conflict with Deadpool and both were lucky to survive the experience! Of course, we could only be talking about Bullseye! 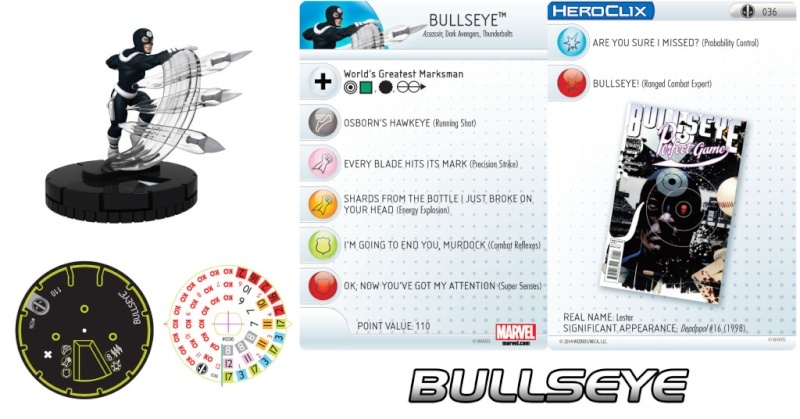 As the World’s Greatest Marksman (in his mind at least), Bullseye possesses the Improved Targeting combat ability allowing him to ignore the effects of hindering terrain, other characters, and even adjacency when making ranged combat attacks! Combined with his early-dial Running Shot and 8 range with three targets, World’s Greatest Marksman almost assures that Bullseye will always have a valid target within range! Bullseye also begins the game with Precision Strike which guarantees that he will do at least one click of damage to his target, and should he miss (unlikely, we know) his Probability Control ensures that he gets another shot (no pun intended)! While the first half of Bullseye’s dial seems to be more focused on sniping his foes and whittling them down, his late-dial is almost dedicated to dishing out a lot of damage! Mid- to late-dial, Bullseye switches tactics slightly and trades in Precision Strike for Energy Explosion and picks up Ranged Combat Expert for a few more options as well! Defensively, Bullseye is made for running up to his enemies and making ranged combat attacks point blank with little fear of reprisal thanks to his Combat Reflexes! (which adds +2 to Bullseye’s defense in close combat) Late-dial, Bullseye picks up Super Senses allowing him to potentially avoid attacks altogether! 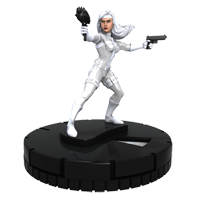 With extremely competitive and consistent combat values and a fantastic offensive power set, Bullseye is a great addition to any HeroClix force at only 110 points. The Assassin, Dark Avengers, and Thunderbolts keywords ensure that Bullseye can contribute some ranged muscle to theme teams as well! That’s all we have for today, but be sure to join us next week for a pair of bail bonds-agents turned Heroes-For-Hire! Until then, keep your Clix off their K.O.’s! 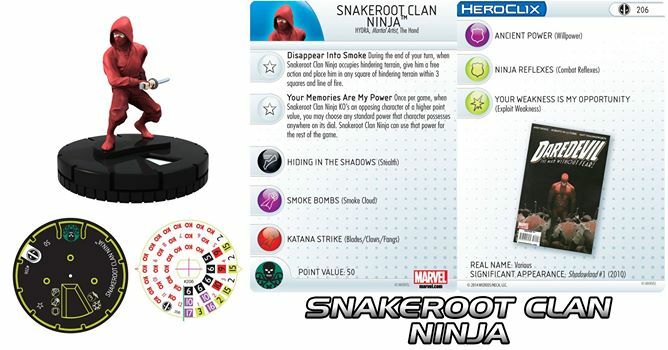 In today’s Marvel HeroClix: Deadpool preview, we’re taking a closer look at the Split and Merge abilities that our newer HeroClix players may find helpful (though experienced players may find this review a useful refresher as well). 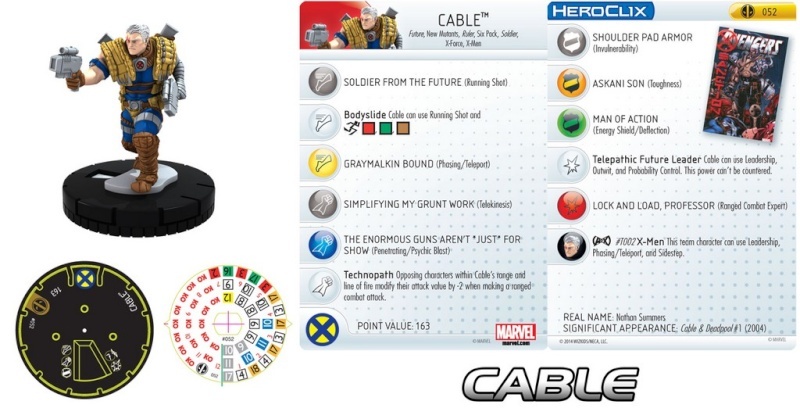 To aid us in understanding these somewhat tricky abilities, we’re shining the spotlight on two characters found in the upcoming Marvel HeroClix: Deadpool set. Please welcome the Daughters of the Dragon, Colleen Wing and Misty Knight! 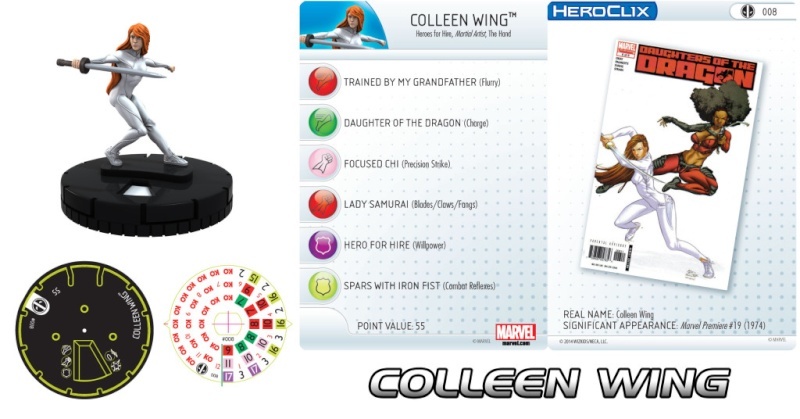 Colleen Wing comes into play at 55 points and has a trio of keywords (Heroes for Hire, Martial Artist and The Hand) to offer you options when including her on a themed team. Colleen Wing has a no-nonsense dial with no special powers but she packs plenty of punch in close combat with Precision Strike and Blades/Claws/Fangs respectively in her attack slot and Flurry and Charge in her speed slot. Defensively, Colleen Wing starts with Willpower to avoid pushing damage. She then switches to Combat Reflexes to give her defensive value a boost when she’s in close combat. Misty Knight comes into play at 85 points and shares the Heroes for Hire keyword with Colleen Wing. Misty Knight also has the Defenders, Detective and Police keywords. Misty Knight can hold her own when it comes to close or ranged combat as she starts with Running Shot on the front half of her speed slot and Sidestep on the back end. 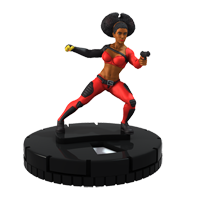 Misty Knight also sports a range of six squares with a single target. On Misty Knight’s first and last clicks she has a special power called Bionic Arm that lets her use Close Combat Expert. Sandwiched between those Bionic Arm clicks are a pair of Incapacitate and Precision Strike clicks. 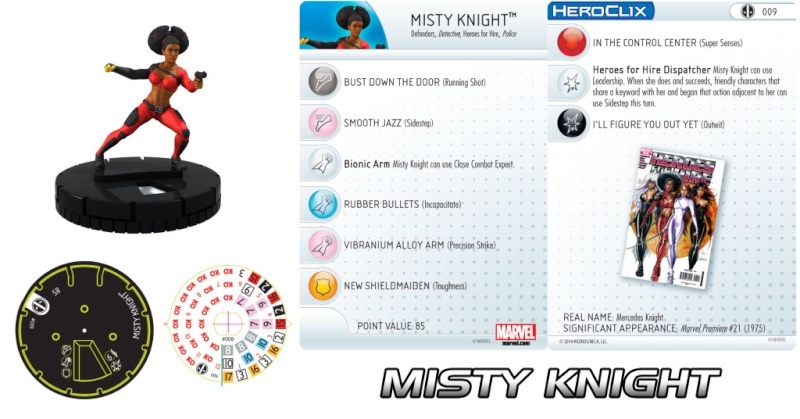 On the front half of Misty Knight’s dial she has another special power, this time in her damage slot, called Heroes for Hire Dispatcher which lets her use Leadership with a twist: When Misty Knight uses Leadership and succeeds, friendly characters that share a keyword with her and begin that action adjacent to her can use Sidestep this turn. Defensively, Misty Knight starts with Toughness and ends with Super Senses. 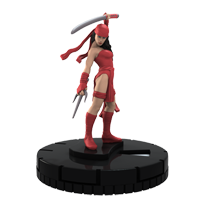 For Colleen Wing and Misty Knight, we have a Duo character available for them to Merge into, #044 Colleen Wing and Misty Knight from the Marvel HeroClix: Amazing Spider-Man set. To Merge our separate Colleen Wing and Misty Knight characters, they’ll need to be adjacent to one another. Colleen Wing and Misty Knight will also need to have no action tokens on them. Oh, and their names will need to be listed on the Duo character’s character card. If all three of those criteria are met, our separate Colleen Wing and Misty Knight characters will also need to have a combined point value equal or greater than the point value of the Duo character. The Colleen Wing and Misty Knight Duo have point values of 70 and 140 points. The 140-point value is what we’re looking at here. 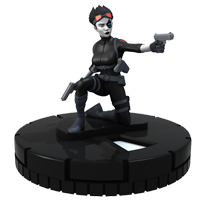 The Colleen Wing and Misty Knight characters from Marvel HeroClix: Deadpool combine for 140 points, which is equal to the point value of the Duo. One thing to note about Merge is that game effects assigned to the individual characters transfer to the Duo. Also, the Duo can use the transferred effect provided that it qualifies for it. Our #008 Colleen Wing has The Hand keyword so we can assign The Hand additional team ability to her (found here). The Colleen Wing and Misty Knight Duo also has The Hand keyword so when we Merge #008 Colleen Wing with #009 Misty Knight, they Duo character can use The Hand ATA because it qualifies for its use. To Split our Colleen Wing and Misty Knight Duo, we’ll need to give is a power action if it has no action tokens already on it. We can then replace the Duo with one or more characters that qualify by name from the entries listed on the Duo’s character card. Remember the point values from our individual from Colleen Wing and Misty Knight characters? To use Split, the replacement characters can’t have a point value greater than the Duo, unless those characters previously used the Merge ability to be replaced by this character. Want to get our individual Colleen Wing and Misty Knight characters immediately into the fight? Not so fast! When Split has been used, replacement characters are given action tokens and can’t be given an action the same turn they’ve been Split. Similar to Merge, game effects that are assigned to a Duo character that has used Split are transferred to one qualifying character of the controller’s choice. However, if the game effect was added to the Duo via the Merge ability then the effect doesn’t have to go back to the original figure. So in our previous example of The Hand ATA, you could transfer it to Misty Knight if for some reason you wanted to – but remember that she won’t be able to use it unless she qualifies for its use. Finally, with Merge and Split the replacement characters begin their dial a number of clicks from their starting line equal to the number of clicks from the Duo character’s starting line. If Misty Knight has taken some damage and is toward the end of her dial but Colleen Wing is still on her first click, give the action to Merge into the Colleen Wing and Misty Knight Duo to Colleen Wing and the replacement character would come into play on its first click. Later, if the Colleen Wing and Misty Knight Duo has taken some damage and you wish to Split them back to the individual characters, then both replacement characters would start on the same number of clicks from their starting lines that the Duo character was on. Thanks for reading! If you have questions about Split and Merge or any other HeroClix rules, email HeroClixRules@gmail.com, and join us here next week for another exciting peek at Marvel HeroClix: Deadpool where we take a closer look at a former member of the Thunderbolts best described as “fast and furious”. Until then, keep your Clix off their K.O.’s! 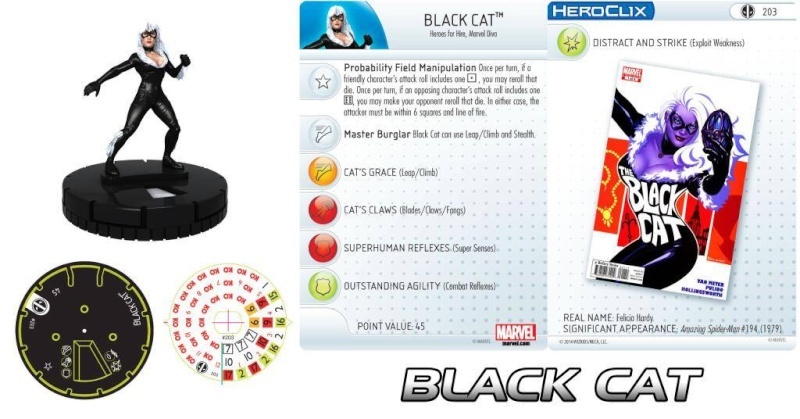 Today we have a quick preview from the upcoming Marvel HeroClix: Deadpool set, we have 2 characters to preview though, so we’ll need to be fast! James Saunders (Earth-616) was an unhappy chemist, tired of the daily grind at Hudson Pharmaceuticals, when he was contacted by the Grandmaster and offered a formula that would grant him superhuman speed. He took the rest of the day off and created the formula and joined the Squadron Sinister to fight the Avengers. Speed Demon is 110 points, 6 clicks of life, and Improved Movement ignores hindering terrain and characters for movement purposes. Speaking of movement, he really has some energetic movement powers! His top 2 clicks start with Hypersonic Speed with high movement which works great with his trait we’ll talk about in the next paragraph. His last 4 clicks have the special movement power Two-Fer which says Speed Demon can use Hypersonic Speed. When he does, during his move, he may be given a free action to make a second close combat attack. On clicks 3 and 4 this could deal potentially 6 clicks of damage, and up to another 3 clicks of damage with his trait! 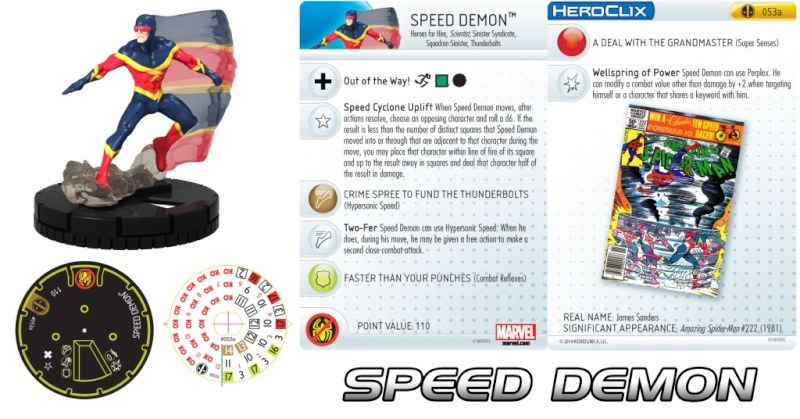 Speed Demon has the trait Speed Cyclone Uplift that says when Speed Demon moves, after actions resolve, choose an opposing character and roll a d6. If the result is less than the number of distinct squares that Speed Demon moved into or through that are adjacent to that character during the move, you may place that character within line of fire of its square and up to the result away in squares and deal that character half of the result in damage. That’s a rapid barrage of words! Let’s break down how this works. The first sentence is self-explanatory “when Speed Demon moves, after actions resolve, choose an opposing character and roll a d6” for conveniences sake, we’ll say you rolled a 6. The second sentence starts “if the result is less than the number of distinct squares that Speed Demon moved into or through that are adjacent to that character during the move.” On his top click he has a 14 movement, if Speed Demon moves 5 squares makes an attack on an opposing character, then that will be square one. After the attack he will continue his movement, he will move 6 more squares all adjacent to the opposing character, and finish up with his 3 remaining clicks of movement. That will be 7 clicks of adjacent movement on the opposing character. The last part of the sentence reads “you may place that character within line of fire of its square and up to the result away in squares and deal that character half of the result in damage.” You can place the opposing character up to 6 squares from its current square within line of fire and deal half the result (3 for the dice roll of 6) to the character. Speed Demon, on click 3, can use his Two-Fer special power, attack 2 different characters for 3 damage each, then use his trait to potentially deal another character up to 3 damage and place them up to 6 squares away from their current square, say goodbye to that pesky Stealth. Speed demon has the Sinister Syndicate Team Ability and the keywords Heroes for Hire, Scientist, Sinister Syndicate, Squadron Sinister, and Thunderbolts. Defensively, Speed Demon starts his top 3 clicks with Combat Reflexes, so feel free to park him after an attack adjacent to an opposing character and his last 3 clicks he has Super Senses. Also on his last 3 clicks he has the special power Wellspring of Power that states Speed Demon can use Perplex. He can modify a combat value other than damage by +2 when targeting himself or a character that shares a keyword with him. This will allow him to pump up his stats to make sure he continues to hit on the latter part of his dial! Now for a swift change to our next preview character, Whizzer! Stanley Stewart (Earth-712) was a mail carrier and avid runner, on an evening jog, he passed through a glowing fog. After he noticed he was getting faster and events started to seem they were in slow motion. As he continued to train, his abilities became super-human and he became a founding member of the Squadron Supreme as Whizzer. Whizzer is a Prime piece priced at 120 points. He has Improved Movement ignores characters and also ignores hindering, blocking, water, and elevated terrains on movement as well. Whizzer’s combat values are the same Speed Demon’s, high movement, good attack, defense, and damage values. Whizzer has a special movement power similar Speed Demon as well called The World at 500 MPH. It states Whizzer can use Hypersonic Speed. When he does, during his move, he may be given a free action to make a second close combat attack. He has this power for his first 2 clicks and if he hits with both attacks, can deal up to 6 damage total. Defensively Whizzer for his first 3 clicks has the special power Friction Shield that allows Whizzer to use Combat Reflexes and Super Senses. Stopping adjacent to your opponent may be the best strategy to get that 19 defense! Click 4 he slows down a little and transitions to straight up Combat Reflexes. 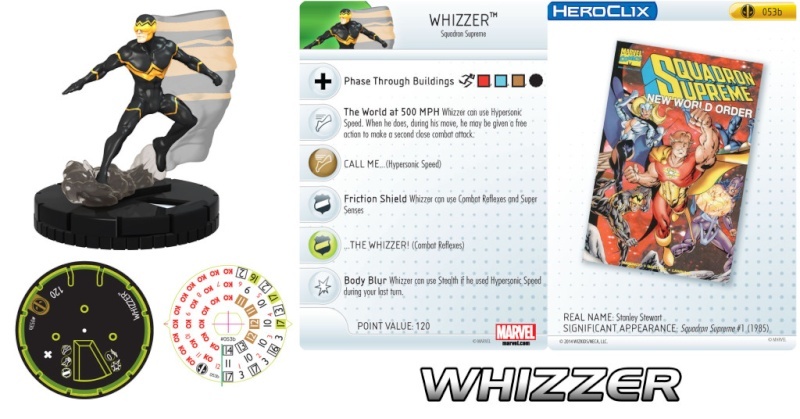 Late on Whizzers’ dial, he gets the special power Body Blur that states Whizzer can use Stealth if he used Hypersonic Speed on your turn. This shouldn’t be a problem with Whizzers’ Indomitable that lets him push without taking damage, but take into account he doesn’t ignore hindering terrain itself on movement if you park him in it for defensive reasons. Whizzer has the Squadron Supreme keyword; currently only Hyperion is the only other legal character in Modern Age that possesses that keyword, and you can make use of the Squadron Supreme ATA with characters using the Squadron Sinister keyword as well. It says while at least two friendly characters using this team ability are adjacent, one of them of your choice can use Mind Control. This team ability cannot be used by wild cards. So use it on both Speed Demon and Whizzer! 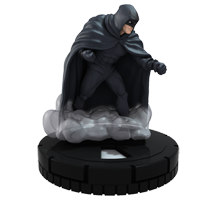 Thanks for skimming through todays preview and be sure to continue to check back with us as we preview more figures from the upcoming Marvel HeroClix: Deadpool preview set, we don’t want to have to yell loudly at you for missing it! 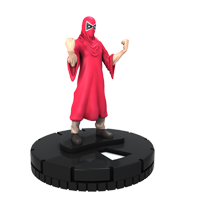 In the upcoming Marvel HeroClix: Deadpool set, we return to a simpler time and welcome to another episode of “As the Dial Clix“. In today’s episode, we learn of the love of a lost father, a devious cousin with plans of his own and the daughter who brought them both together again, well maybe? Our story opens as 2 cousin’s fight over the love of a woman and the riches of the family estate. The Banshee, Sean Cassidy, has the X-Men and Police team abilities and shows his standing with both the NYPD and Interpol. Banshee has an 8 range and can use Improved Targeting to ignore both elevated and hindering terrain. 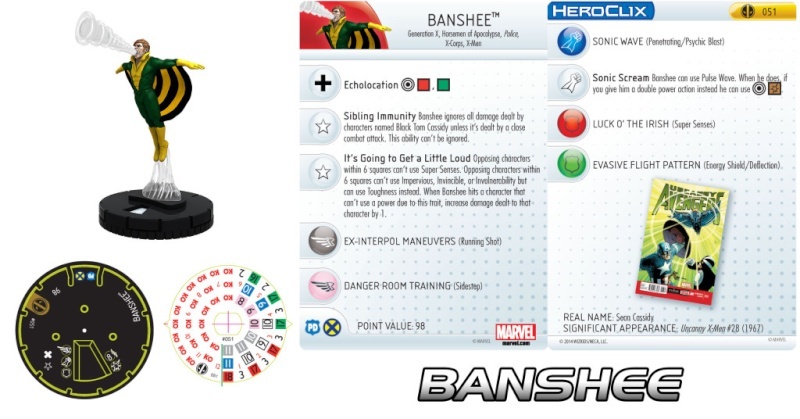 Banshee possesses 2 traits the first of which is Sibling Immunity and will allow Banshee to ignore all damage dealt by characters named Black Tom Cassidy, or shall we say cousin, unless it’s dealt by a close combat attack. This ability can’t be ignored. Banshee’s second trait is called it’s Going to Get A Little Loud. First off all opposing characters within 6 squares can’t use Super Senses, just Blam! As well opposing characters within 6 squares can’t use Impervious, Invincible, or Invulnerability but can use Toughness instead, double Blam! Lastly when Banshee makes an attack and hits a character that can’t use a power due to this trait, increase damage dealt to that character by 1. This trait is worded in the same way as a Critical Hit and therefor would not be subject to the rule of 3 as you are not modifying a combat value you are just increasing damage actually being dealt. With that on Banshee’s top 4 clicks he could deal 8 clicks of damage to an opposing character. Banshee starts with 3, then you modify by 3 (either using perplex or enhancement or something) and we are now at 6. The opposing character is one affected by Banshee’s trait adding 1 to damage dealt and then you actually roll a critical hit adding another 1 to damage dealt. Blam! Blam!! Blam!!! Have fun with that. Positioning shouldn’t be a problem as Banshee has a starting 11 movement with Running Shot which will giving him a 14 square swing in which to target an opposing character with Penetrating/Psychic Blast even if they are trying to hide on top of elevated terrain. Banshee’s defense is covered by Super Senses. Banshee has a special attack power called Sonic Scream this will allow him to use Pulse Wave. When he does, if you give him a double power action instead he can use Improved Targeting with Blocking Burst. Banshee’s late dial has Sidestep. Energy Shield/Deflection and will regain the use of Penetrating/Psychic Blast. At 98 points Banshee is a steal and could easily make his way onto any Generation X, Horseman of Apocalypse, Police, X-Corps or X-Men themed teams. Banshee’s cousin Thomas Cassidy, also known in some Brotherhood of Mutants circles as Black Tom Cassidy, hid Sean’s daughter from him. 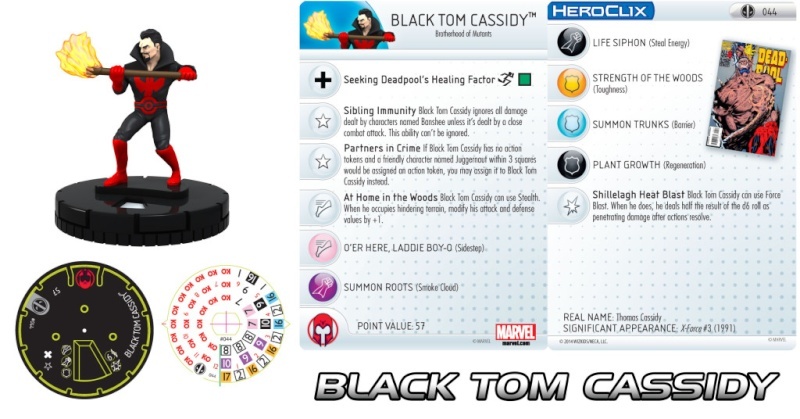 Black Tom Cassidy has Improved Movement and will ignore hindering terrain during movement. The first of his 2 traits is like cousin Sean’s and is called Sibling Immunity. This will allow Black Tom Cassidy to ignore all damage dealt by characters named Banshee unless it’s dealt by a close combat attack. This ability can’t be ignored. Black Tom Cassidy’s second trait Partners In Crime, bring together brains and brawl. If Back Tom Cassidy has no action tokens and a friendly character named Juggernaut is within 3 squares and would be assigned an action token, you may assign it to Black Tom Cassidy instead. Black Tom Cassidy starts off with 2 special powers. His movement special power is called At Home In The Woods and will allow him to use Stealth, however when he actually occupies hindering terrain, modify his attack and defense values by +1. Black Tom Cassidy’s special damage power is called Shillelagh Heat Blast and will allow him to use Force Blast. When he does, he deals half the result of the d6 roll as penetrating damage after actions resolve. Black Tom Cassidy has a nice 6 click dial for just 57 points. His standard powers will start off with Smoke Cloud and Toughness. At the ending of his dial Black Tom Cassidy will be able to use Sidestep, Steal Energy, and Barrier. Black Tom Cassidy’s final ending click has Regeneration. Black Tom Cassidy possesses the Brotherhood of Mutants team ability and keyword. Raised by Tom Cassidy but eventually reunited with her dad, Banshee, Theresa Cassidy comes into her own as Siryn. Siryn has a trait called Father, Uncle, and…? When Siryn is adjacent to a friendly character named Banshee, Black Tom Cassidy, or Deadpool, modify Siryn’s and those adjacent characters’ attack values by +1 unless already modified by this effect. 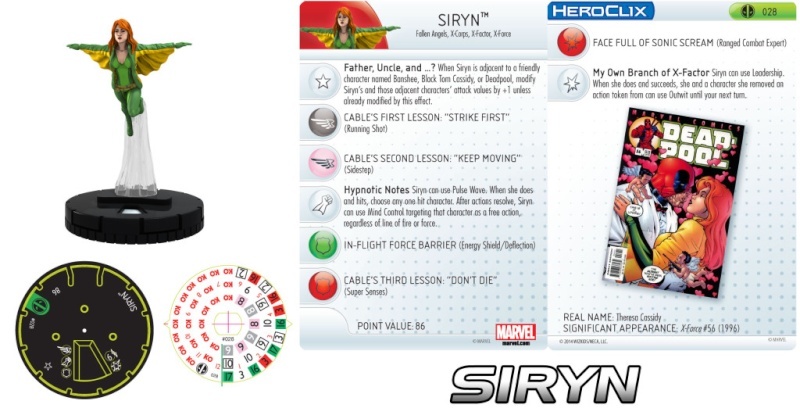 Siryn starts out with Running Shot, Energy Shield/Deflection and a special attack power called Hypnotic Notes. This will allow Siryn to use Pulse Wave and she has a range value of 6. When she uses Pulse Wave and hits, choose any one hit character. After actions resolve, Siryn can use Mind Control targeting that character as a free action, regardless of line of fire or force. Hey dad this is going to hurt but would you like to go again? Siryn will gain some Sidestep and Ranged Combat Expert throughout her dial. Mid-dial Siryn will gain a special damage power called My Own Branch Of X-Factor, this will allow her to use Leadership. When she does and succeeds, she and a character Siryn removed an action token from can use Outwit until your next turn. Siryn ends her dial with the use of Super Senses. Siryn possesses the Fallen Angels, X-Corps, X-Factor, and X-Force keywords and will only cost 86 points to field. 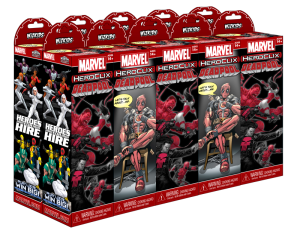 Thanks for joining in on our story and be sure to continue to check back as we look at figures from the upcoming Marvel HeroClix: Deadpool set. Until then, Shape Change for the Win!! 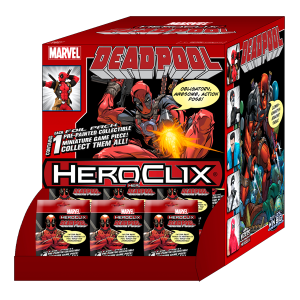 Welcome back as we continue to explore the upcoming Marvel HeroClix: Deadpool set! Today, we bring you an agent of the evil Corporation sent to infiltrate S.H.I.E.L.D., Denise Baranger, better known as the Vamp! Vamp begins play taking the fight right to her opponents with a printed 5 range and Running Shot. Unaware of her true abilities, S.H.I.E.L.D. outfitted her with an Absorbo-Belt to give her “super powers.” Her Absorbo-Belt allows Vamp to be given a free action to target a character within 5 squares, and until her next turn, she can use the standard powers that character posses, as long as they are within 5 squares of her. She will have this special power for most of her dial. Protecting her from range counter attacks are a couple opening clicks of Energy Shield Deflection. The next power she gains is a sign of the true power she has, as Vamp uses her telepathy to Outwit a power on an opposing figure. In the next section of her dial, Vamp chooses to keep hidden with a couple of clicks of Stealth. Still using her Outwit and Absorbo-Belt to your team’s advantage, she now has Combat Reflexes to make her harder to hit in close combat, which she will have for the rest of her dial. The last section of her dial sees her able to move as a free action with Sidestep. She will also be able to hit all figures within 3 squares for 1 unavoidable damage with Pulse Wave. 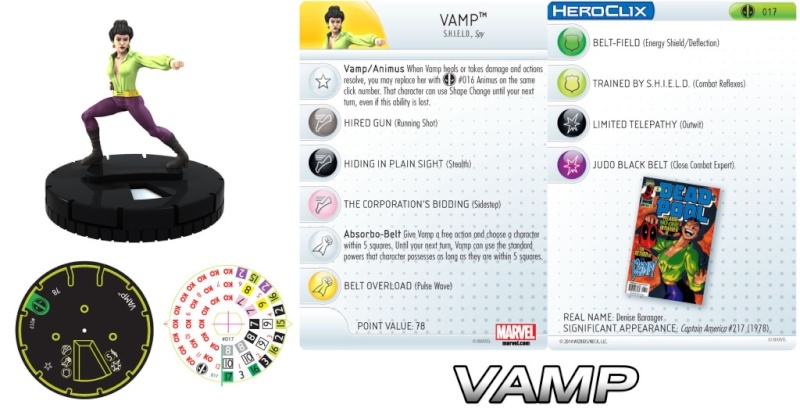 Also on her last two clicks, Vamp shows the combat abilities for which she was chosen to be a S.H.I.E.L.D. Super Agent with Close Combat Expert. Vamp will fit easily on to most Spy or S.H.I.E.L.D. theme teams at 78 points. She will be a decent secondary attacker when building to make her Absorbo-Belt special power useful, as well as using adjacent friendly S.H.I.E.L.D. team members S.H.I.E.L.D. team ability. Vamp has a secret she kept from S.H.I.E.L.D. As a member of the Corporation, she has a trait allowing her to change into Animus. Vamp/Animus says when an action resolves in which Vamp heels or takes damage, you may replace her with Deedpool #016 Animus on the same click number. That figure can use Shape Change until your next turn, even if this ability is lost. Animus has the reverse trait Vamp, called Animus/Vamp. When Animus heals or is damaged, when that action resolves, she may be given a free action to be replaces with Deedpool #017 Vamp on the same click number. She may use Shape Change until your next turn, even if this ability is lost. Animus runs right at an opposing figure using a couple clicks of Charge. She also has a special power giving her a couple of options. Called Mental Brute, it allows her to use objects in close combat attacks with Super Strength, make range attacks with her printed 4 range and Penetrating/ Psychic Blast, or gain some board control with Telekinesis. A long run of Toughness will provide her some damage reduction. The next section of her dial allows her some free action movement with Sidestep. 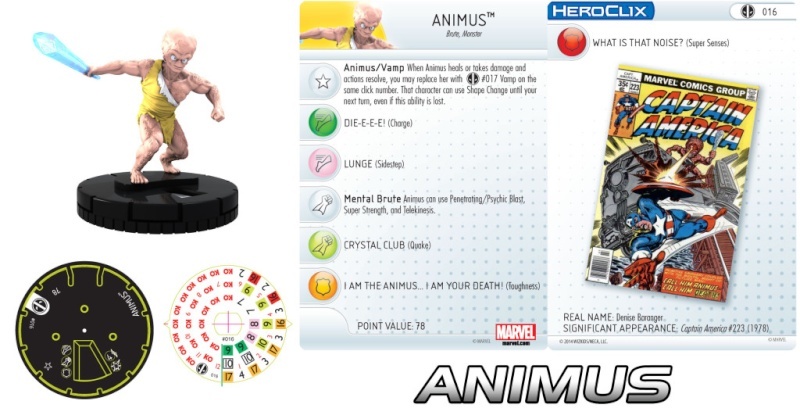 In combat, Animus uses a crystalline club that has most of her psionic energy stored in it. This is represented by Quake for the rest of her dial. On her last two clicks, she attempts to evade attacks with Super Senses. Animus can be played on teams using the Brute or Monster keywords. At 78 points, she will bring a solid secondary attacker with a few tricks up her sleeve, as well as the ability to bring Vamps abilities to your force. That’s all we have for today. 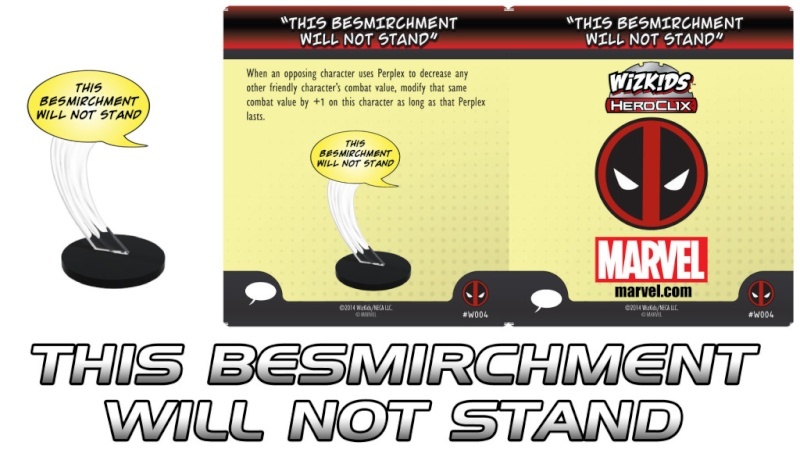 Thanks for reading and as always, come back to see what is revealed next as we continue to explore the upcoming Marvel HeroClix: Deadpool set! Shang-Chi is a 90-point close combat machine with a set of attack values that never dip below 11. The rest of his numbers are fairly consistent as well. Shang-Chi also has an Improved Movement ability called My Journey Never Ends which lets him ignore elevated terrain and outdoor blocking terrain when he moves. The star of Shang-Chi’s dial is a trait called Counter-Block that lets his deadly hands of kung fu pound away at an opponent. Each time an opposing character targets and misses Shang-Chi with an attack, place a Counter token on his card. Shang-Chi can be given a free action to remove all Counter tokens and make that many close combat attacks. These attacks have a locked damage value of 2. At the end of your turn, remove all Counter tokens. 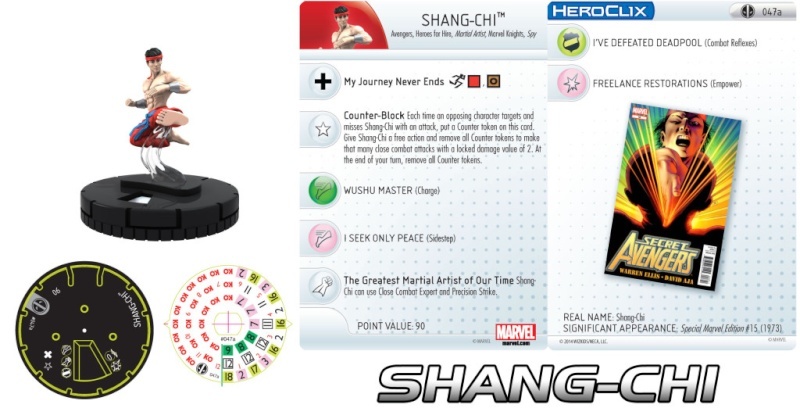 Counter-Block appears on the first four clicks of Shang-Chi’s dial. Counter-Block works well with the other powers found on Shang-Chi’s dial. On the front half of Shang-Chi’s dial he has Charge to quickly get him into the thick of combat then attack. On the first four clicks of Shang-Chi’s attack slot he has a special power called The Greatest Martial Artist of Our Time, which grants him the use of Close Combat Expert and Precision Strike. Move Shang-Chi adjacent to an opposing character with Charge, then make a close combat action as a free action. Follow that up by using a free action to use Counter-Block and keep punching away. With the Precision Strike from The Greatest Martial Artist of Our Time, Shang-Chi’s attacks from Counter-Block can’t be evaded and the damage dealt can’t be reduced below 1 or transferred. Defensively, Shang-Chi has a full dial of Combat Reflexes and a consistent set of combat values that make it difficult to land close combat attacks on him. On his opening click, Shang-Chi has an effective defense of 20 against close combat attacks. Shang-Chi also has the Indomitable combat ability, which lets him use Willpower to follow up with his attacks without fear of taking pushing damage. Shang-Chi has shared his vast martial arts knowledge to other heroes so Empower appears on his first and last two clicks, allowing him to boost the damage value of an adjacent friendly character when that character makes a close combat attack. Shang-Chi has an array of named and generic keywords to aid you in incorporating him on themed teams: Avengers, Heroes for Hire, Martial Artist, Marvel Knights, and Spy. With a point cost below 100, Shang-Chi leaves plenty of room for other heavy hitters or support characters on your force. You may want to team up Shang-Chi with the Daughters of the Dragon, Colleen Wing and Misty Knight (LINK TO THAT PREVIEW HERE), for the bulk of a themed Heroes for Hire force. Now that we’ve seen what Shang-Chi brings to the battlefield, let’s take a look at the dial for his Prime counterpart, Shen Kuei (aka Cat). 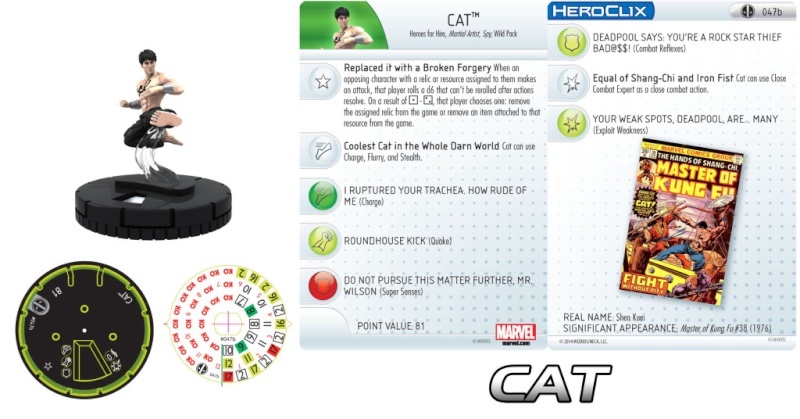 Cat comes into play at 81 points and shares the Heroes for Hire, Martial Artist and Spy keywords with Shang-Chi. Cat also has the Wild Pack keyword for an additional theme team building option. A master thief whose martial arts skill rivals Shang-Chi’s, Cat hits the battlefield with an aggressive power set and a trait called Replaced it with a Broken Forgery that can really foil the plans of an opponent who relies heavily on relics and resources. When an opposing character with a relic or resource attached to it makes an attack, after actions resolve that player rolls a d6 that can’t be rerolled. On a result of 1 or 2, that player then chooses to either remove the assigned relic from the game or remove an item attached to resource from the game. Moving on to the rest of Cat’s dial, he has a special power scattered throughout his speed slot called Coolest Cat in the Whole Darn World, which lets him use Charge, Flurry, and Stealth. Regular use of Charge appears on the rest of Cat’s clicks. Cat’s dial starts with an attack value of 12 and ends with 10s on his last two clicks. On Cat’s first two clicks he has Quake, which works in combination with the Charge power. Speaking of combining powers, Cat has a special power on the first four clicks of his damage slot called Equal of Shang-Chi and Iron Fist that lets him use Close Combat Expert as a close combat action. This means Cat can use Close Combat Expert with the Flurry and/or Charge granted by his Coolest Cat in the Whole Darn World special power. Cat’s last two clicks feature Exploit Weakness to help his damage get past opposing characters’ reducers. You won’t be able to use Close Combat Expert from Equal of Shang-Chi and Iron Fist with Cat’s Quake as each power requires a close combat action to activate. Defensively, Cat alternates between Super Senses and Combat Reflexes on his first three clicks. He then ends the rest of his dial with the latter power. Like Shang-Chi, Cat has a very consistent set of combat values. In his damage track alone, Cat sports nothing but base values of 2 which are supplemented by either Equal of Shang-Chi and Iron Fist or Exploit Weakness. Cat makes a viable choice as a secondary attacker and should find his way on many forces as a close combat threat. Thanks for reading! Enjoy your chimichangas and join us next time as we uncover more secrets from upcoming HeroClix sets.